ETLG Inertial Aerosystems announce a range of strain gauges designed for Asphalt and Concrete structures monitoring. The gauges utilise four active elements of a Wheatstone bridge circuit which compensates for temperature change and customer specified cable length resistance. 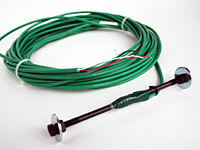 The sensors are easily adaptable to most data acquisition systems without additional signal conditioning. While the standard units measure axial strain and reject bending strain, they can be configured to measure bending strain and reject axial strain. The low modulus, ruggedised Asphalt sensors are built to withstand the high temperature and vibratory rolled compaction required for asphalt placement. The low profile Concrete gauge has applications in concrete runways and roads, columns, walls, bridge elements. Each sensor is individually calibrated and supplied with fabrication Quality-Control documentation.